Crop Top Prom Dresses - Biggest Prom Dress Trends. other celebrities have rocked this style on the red carpet. Why just buy any prom dress off the rack? Why not custom design your own prom dress. Create a custom-made dress from a sketch, thumb though your favorite Prom magazines and custom design a dress just for you. Choose fabric, colors and styles to build the dress of your dreams. Get a celebrity style look for a fraction of the price. Choose amazing celebrity inspired dresses like seen on the red carpet at movie premiers. These celebrity dresses are sure to land you on the best dress list for the evening. Send us your clear photo and ideas, we will work with you. These Dresses are by Special Order and are specifically made to fulfill your order. 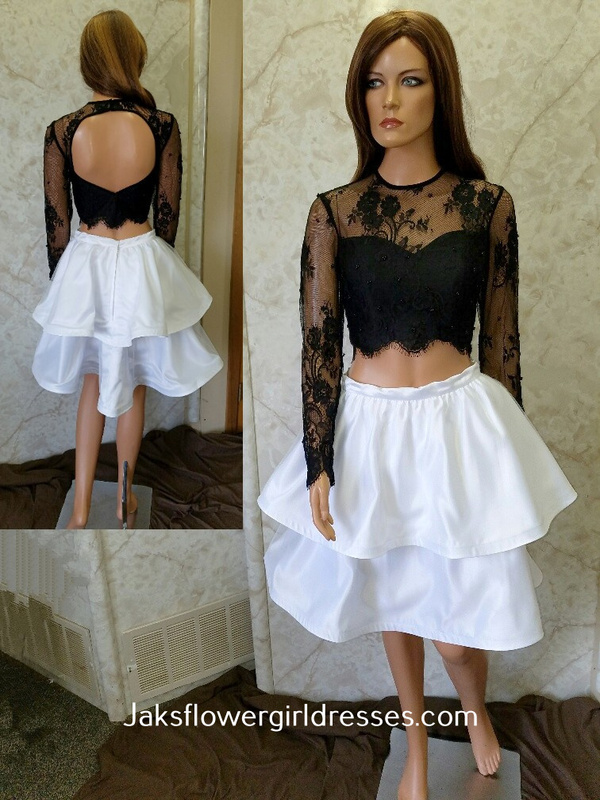 Crop top skirt set and two piece chic girls outfit with keyhole back. Black and white striped crop top and fit and flare skirt. pink Mac Duggal size 4.